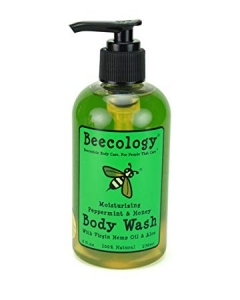 A natural body wash I really enjoy using during a hot shower and bath is the Beecology Natural Honey and Peppermint Body Wash. I like this body wash because it contains all natural nourishing and cleansing ingredients in it such as peppermint oil, aloe, glycerin, hemp oil, olive oil, coconut oil, honey and citric acid. I like these ingredients because they gently cleanse my skin without drying it out and making it irritated. I even like the way it helps moisturize my skin as I wash up with it or soak in it in a bath. other things I really like about this body wash is the 8 ounce hand pumping bottle it comes in, the lovely sweet strong peppermint scent it has, and the lavish rich golden like honey color and texture of it. I even like the way this body wash lathers up with plenty of little foamy bubbles on my bath sponge. I also enjoy that this body wash is reasonably prices. I only pay $9 per bottle which is really a good deal for an all natural body wash.
by getting into the shower and soaking my body down with plenty of hot water. Then I like to take my bath sponge, get it wet, pump some of the body wash onto my bath sponge and than lather my body up from head to toe with the light foamy bubbles. As I wash up in the shower with this body was I really love how clean it gets my body and the lovely peppermint scent it releases into the air that helps calm my mind down for an even more relaxing and rejuvenating shower. it provides my body with a cooling soothing sensation that helps relieve ache muscles and itchy skin. I even like to soak in this body wash because it helps soften my skin up really well when it is dried out. I would highly recommend this all natural body wash to anyone who loves the scent of peppermint and a good way to naturally clean up and relieve stress from their body in a bath or shower. I know my family loves this natural body wash and I try too always keep it on hand in my home to use daily. Own it. Want to sell. To Buy or Not to Buy ?